Unable to take time out to do more ski biking and determined to be ready for the next winter season I spent a lot of free time searching the net for my skibike solution. I had wrongly assumed that a Brenter, just like the one that I trained on, would be freely available during the summer end of season clearouts. Yet despite some months of searching nothing came up on any of the European eBay websites and I baulked at the amount some of the dealers were asking for ex rental skibikes. I couldn't justify the price of a brand new skibike for something that might not have worked out for me, or just get used a couple of weeks a year at most. 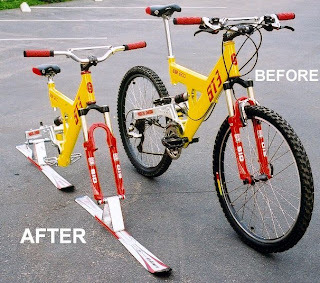 I certainly wanted my own skibike so as to have the freedom and autonomy that ownership provides. There were some interesting "backyard engineering" designs such as This one! The risk of a homemade device failing whilst on the most difficult run on the mountain, leaving you stranded, injured and ruining your holiday. I happened across the WinterXbike.com conversion kit but wasn't sure whether they were still in business as the content seemed a little out of date. The principle seemed so alluring, take a readily available mountain bike, strip off most of the parts and bolt on some short skis. on the understanding that it wouldn't arrive before Thanksgiving. Being a Brit, I had to look up when that was. My next task would be to locate a suitable frame.